The Brother PPD has three external peripherals ports: a TV port to display video output, an FB100/knitting machine port and a printer port. Two of these ports were alrready supported by your PC: a TV card can turn your PC into a TV and FB100 Emulator turns your PC into an FB100. PPD Print now turns your PC into a printer for the PPD. 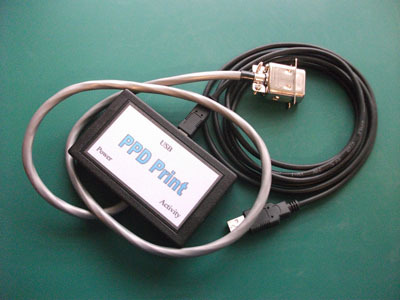 PPD Print is a cable to connect the Brother PPD printer port to a USB port of your computer. Using PPD Print Utility, the driver program of the PPD Print, you can capture the printer output of the PPD and store it on your computer for further processing. The picture above shows a sample of the output captured for a Stitch pattern Cartridge III. As the captured data is stored as monochrome bitmaps, you can combine multiple pages easily with for example MS Paint.